This woman was headed to our office, and I'm sure was not expecting to get her photo taken at the same time she was requesting information, but I couldn't miss the opportunity for a shot of her beautiful cape. 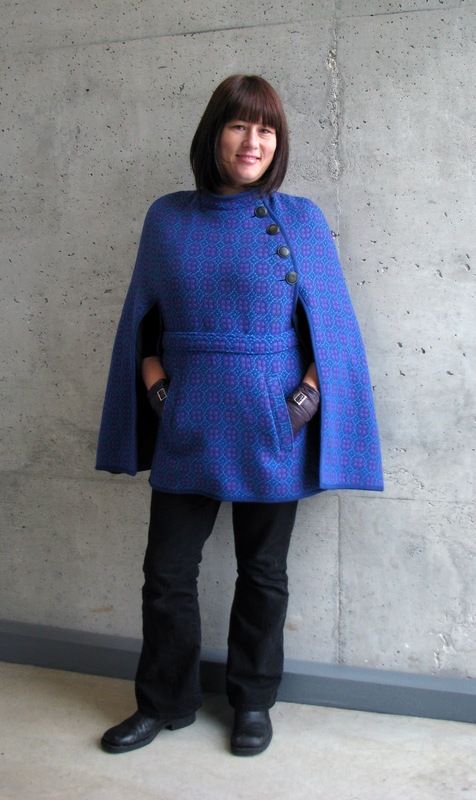 I've seen a lot of capes shown for fall this year and they are perfect for this type of weather. They can be a bit tricky to wear, and unfortunately don't allow for an over-the-shoulder bag, so one is forced to adopt the more "lady-like" method of carrying your purse in your hand. This one has such a striking colour combination (set off by the purple leather gloves) and is a light wool, woven in Wales (according to the label). The wearer picked it up at Talize, which, like Value Village, can be a great source of unique, inexpensive clothing if you have time and patience. Looooooove this! It is so flattering. It just makes me want to be a bit more vigilant when I go to Taleeze... I get overwhelmed and give up too easily.